PAST DRUMMERS...Spinal Tap has nothing on us. 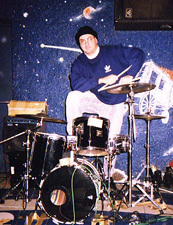 Former drummer for the band "Nobody," Randy helped us through the transitional period between losing Berg and finding Tom. Thanks alot, Randy. 4 years, 4 months, and 4 days, our longest lasting drummer ever. How he put up with our crap for that long, we'll never know. Berg was our drummer for "eatus," "disconnected," and "nutbag." What a great time it was to have him in the band. Berg currently resides in Phoenix. We love ya, Berg! Extra special thanks to Larry "the one-nut wonder", who served a 2-month term, from April to May 98. No one really knows where Larry is right now, but he's been spotted at Pop's (the 24-hour bar in St. Louis), and Louisiana. If anyone knows of his where-abouts, call 1 (800) ONE NUTT. We had one-derful times with Larry, and hopefully we'll all get to see him really soon. Larry, fearing that one of us would take his only ball in the middle of the night, always slept with it well-protected. Richard displays his monster European kit. This drumset was actually used during the last Swiss-itis tour, and conveniently fit it the glove compartment of our vehicle. 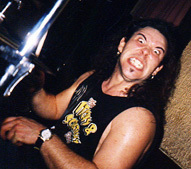 Extra special thanks to Richard Nance of SeventhSign, who did 6 months hard time with "-itis" from Oct. 97 - March 98. We really appreciated it. You rock! We appreciate all your help and your rock-god sonic-master engineer, Cupcake. "-itis" never sounded better than when Rich & Cupcake added their touches. Thanks. Special thanks to George Fortune for the first few years of "-itis." George has since gotten married to Shannon, and moved to upstate N.Y. where he grew up. 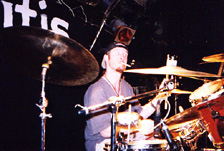 Jimmy was the "original" -itis drummer. When we converted from "Tainted Souls" to "-itis," Jimmy was the guy. He did our last few weeks with Tainted Souls/-itis, and then moved to Colorado Springs, CO.